The GPSMAP 176C is a 12 parallel channel, WAAS-enabled GPS receiver with an extra-large, 16-color display that makes keeping your eye on the map easy. The display measures 3.80 inches diagonal and delivers a crisp picture thanks to a pixel count of 320 x 240. On the inside, the GPSMAP 176C comes equipped with a built-in worldwide basemap and tide data for the United States. The unit is enhanced by GARMIN's BlueChart™ marine cartography, a miniature-size chip that inserts into the unit and provides additional offshore map detail. The cartography includes detailed depth contours, inter-tidal zones, spot soundings, wrecks, navaids, port plans, restricted areas, cable areas, anchorages and much more. 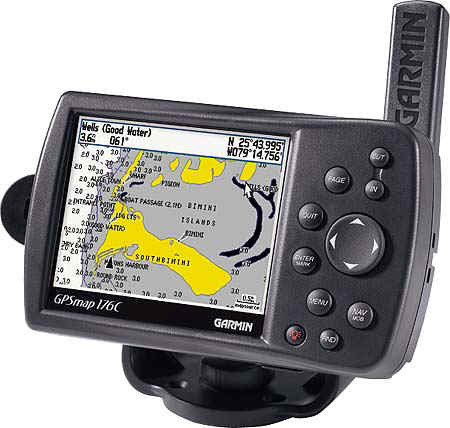 For use in a car, the GPSMAP 176C can accept downloadable information from GARMIN's MapSource MetroGuide U.S.A. and Fishing Hot Spots CD-ROM. A special mounting bracket is available that will allow the GPSMAP 176C to be temporarily mounted in a car. Requires a GARMIN data card to store MapSource map detail. Η ΤΙΜΗ ΕΙΝΑΙ ΜΑΖΙ ME ΤΟ Φ.Π.Α. ΑΛΛΑ ΕΠΙΚΟΙΝΩΝΗΣΤΕ ΓΙΑ ΕΠΙΒΕΒΑΙΩΣΗ ΕΠΕΙΔΗ ΜΠΟΡΕΙ ΝΑ ΕΧΕΙ ΜΕΤΑΒΛΗΘΕΙ. - ΕΞAIΡΕΤΙΚΟ ΦΟΡΗΤΟ ΜΟΝΤΕΛΟ ΜΕ ΘΑΥΜΑΣΙΑ ΕΓΧΡΩΜΗ ΟΘΟΝΗ. ΛΕΙΤΟΥΡΓΕΙ ΚΑΙ ΜΕ 4 ΑΠΛΕΣ ΜΠΑΤΑΡΙΕΣ ΜΕΓΕΘΟΥΣ ΑΑ. - ΤΟ ΠΑΚΕΤΟ ΣΥΜΠΕΡΙΛΑΜΒΑΝΕΙ ΧΩΡΙΣ ΕΠΙ ΠΛΕΩΝ ΧΡΕΩΣΗ ΚΑΙ PC INTERFACE CABLE, POWER/DATA CABLE, ΒΑΣΗ ΣΤΑΘΕΡΗΣ ΣΤΗΡΙΞΗΣ, ΑΝΑΛΥΤΙΚΕΣ ΟΔΗΓΙΕΣ ΧΡΗΣΗΣ, ΚΑΡΤΕΛΑ ΠΕΡΙΛΗΠΤΙΚΩΝ ΟΔΗΓΙΩΝ ΧΡΗΣΗΣ. ΕΙΝΑΙ ΙΔΑΝΙΚΟ ΓΙΑ ΚΑΤΟΧΟΥΣ ΜΙΚΡΩΝ ΚΑΙ ΜΕΓΑΛΩΝ ΣΚΑΦΩΝ ! !!!!! ΔΕΧΕΤΑΙ ΚΑΙ DATA CARDS ME ΛΕΠΤΟΜΕΡΕΣΤΑΤΟΥΣ ΝΑΥΤΙΚΟΥΣ ΧΑΡΤΕΣ ΤΗΣ ΕΛΛΑΔΑΣ ΚΑΘΩΣ ΚΑΙ ΑΛΛΩΝ ΧΩΡΩΝ !!!!! - ΜΕ ΕΠΙ ΠΛΕΟΝ 326.02 € (111.092 ΔΡΧ) ΠΑΙΡΝΕΤΕ ΤΗΝ DATA CARD 16MB ΠΟΥ ΜΠΑΙΝΕΙ ΜΕΣΑ ΣΤΟ GPSMAP 176C Η ΟΠΟΙΑ ΠΕΡΙΕΧΕΙ ΤΟΝ ΠΙΟ ΠΑΝΩ ΑΝΑΛΥΤΙΚΟΤΑΤΟ ΝΑΥΤΙΚΟ ΧΑΡΤΗ ΤΗΣ ΕΛΛΑΔΑΣ MEU015R. - ΤΑΞΙΔΕΥΟΝΤΑΣ ΚΑΤΟΠΙΝ, ΑΝΑ ΠΑΣΑ ΣΤΙΓΜΗ ΒΛΕΠΕΤΕ ΟΛΕΣ ΤΙΣ ΠΛΗΡΟΦΟΡΙΕΣ ΠΟΥ ΔΕΙΧΝΟΥΝ ΤΑ ΚΑΛΑ GPS ΚΑΘΩΣ ΚΑΙ ΟΛΕΣ ΤΙΣ ΝΑΥΤΙΚΕΣ ΠΛΗΡΟΦΟΡΙΕΣ ΠΟΥ ΥΠΑΡΧΟΥΝ ΣΤΟ ΣΗΜΕΙΟ ΠΟΥ ΒΡΙΣΚΕΣΘΕ ΚΑΙ ΓΥΡΩ ΣΑΣ, ΜΕ ΠΟΛΥ ΜΕΓΑΛΗ ΛΕΠΤΟΜΕΡΕΙΑ, ΚΑΝΟΝΤΑΣ ZOOM IN ΣΤΟΝ ΧΑΡΤΗ ΕΠΙ ΤΗΣ ΟΘΟΝΗΣ ! ΤΕΤΟΙΕΣ ΠΛΗΡΟΦΟΡΙΕΣ ΕΙΝΑΙ ΟΙ ΓΕΩΓΡΑΦΙΚΕΣ ΣΥΝΤΕΤΑΓΜΕΝΕΣ ΤΟΥ ΣΗΜΕΙΟΥ ΣΑΣ, ΟΙ ΑΚΤΕΣ ΓΥΡΩ ΣΑΣ, ΟΙ ΥΦΑΛΟΙ, ΟΙ ΣΚΟΠΕΛΟΙ, ΤΟ ΒΑΘΟΣ ΤΟΥ ΝΕΡΟΥ ΚΑΤΩ ΑΠΟ ΤΟ ΣΚΑΦΟΣ ΣΑΣ, Η ΤΑΧΥΤΗΤΑ ΣΑΣ, Η ΚΑΤΕΥΘΥΝΣΗ ΣΑΣ, Η ΩΡΑ ΑΚΡΙΒΩΣ ΚΑΙ ΑΛΛΑ ΠΟΛΛΑ ! - ΜΕ 222.29 € (75.745 ΔΡΧ) ΠΑΙΡΝΕΤΕ ΤΗΝ DATA CARD 8MB ΠΟΥ ΜΠΑΙΝΕΙ ΚΑΙ ΑΥΤΗ ΣΤΟ GPSMAP 176C Η ΟΠΟΙΑ ΠΕΡΙΕΧΕΙ ΤΟΝ ΠΙΟ ΠΑΝΩ ΑΝΑΛΥΤΙΚΟΤΑΤΟ ΝΑΥΤΙΚΟ ΧΑΡΤΗ ΕΝΟΣ ΤΜΗΜΑΤΟΣ ΤΟΥ ΑΙΓΑΙΟΥ ΠΕΛΑΓΟΥΣ MEU405S. - ΥΠΑΡΧΟΥΝ ΑΝΑΛΥΤΙΚΟΙ ΝΑΥΤΙΚΟΙ ΧΑΡΤΕΣ ΣΕ DATA CARD ΠΟΥ ΜΠΟΡΟΥΜΕ ΝΑ ΣΑΣ ΠΡΟΜΗΘΕΥΣΟΥΜΕ, ΟΛΩΝ ΤΩΝ ΠΕΡΙΟΧΩΝ ΤΗΣ ΜΕΣΟΓΕΙΟΥ ΚΑΙ ΣΧΕΔΟΝ ΟΛΩΝ ΤΩΝ ΘΑΛΑΣΣΩΝ ΤΗΣ ΥΔΡΟΓΕΙΟΥ ! Uploadable Maps: Compatible with most MapSource™ products including GARMIN BlueChart™ marine cartography, MetroGuide™ and Fishing Hot Spots™. Requires a GARMIN data card to store MapSource map detail. **These units are also able to transfer waypoints, routes, and tracks between the PC and GPS using MapSourceª.